I love a good tall shoe; I appreciate the height it gives me and the length it adds to my leg. I’m almost always willing to give any shoe a try that promises to lengthen my legs. However, the first time I tried on a pair of booties, even though they had a heel, I felt like they cut my legs off and made me look even more stubby than normal. So I decided that booties probably weren’t for me. But oh there are so many fashion blogs that have girls sporting booties every single day. And I loved every single look. I desperately wanted to find a pair that worked for me. So what’s a girl to do? Why, go to my favorite shoe store of course. Yep, that would be DSW. I scoured the many aisles checking out all of the boot and bootie options and my eyes found these beauties from Kenneth Cole. And you know what, they actually looked pretty good. I love the buckles on the side, such a cute detail. And the best part? They are oh so comfortable; they are like wedges for winter. 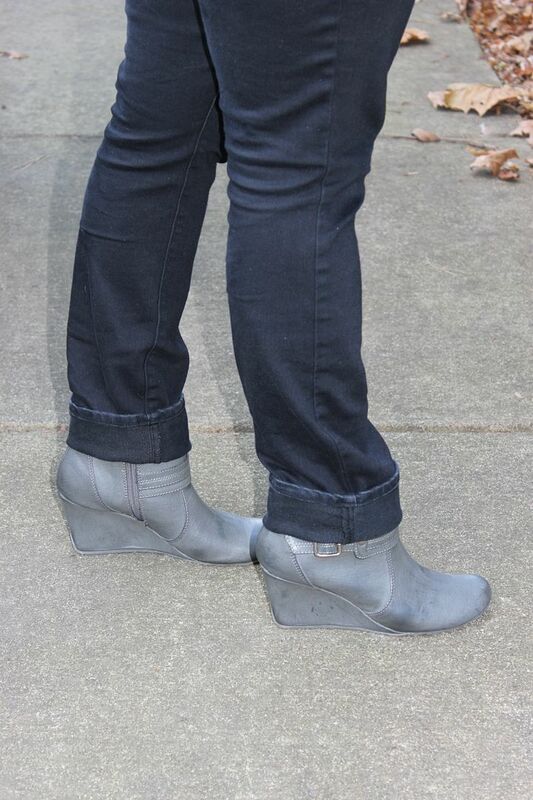 I think these booties are a bit too casual to wear with a skirt or dress, but I like the look with jeans. And yes, I had to cuff the bottoms because I still haven’t found the perfect pair of jeans. One day. But until that day comes, I’m enjoying my cuffed jeans and booties. Purple Tank and Grey Cardigan: New York & Company. Booties: Kenneth Cole via DSW. Necklace: gift from Tolar and Baby K.
So adorable! The booties look great with this outfit, and I'm really loving the ruffled cardigan! I LOVE dsw, and those booties are adorable! it took me awhile to wear booties but now i love them! I love yours! Ha, ha!!! I have that exact pair! I was a little nervous about going synthetic but I have other boots that are and those are just fine. The price and the comfort was right ON so I went for it. Grey booties are really hard to find. I ventured into the bootie thing last year and I love it. Stopping by from WIWW! Happy Thanksgiving! Love these shoes. Wedge booties are so fun.